The sour vegetable dish is an absolute favourite of mine. Happy am I when I get to go to the market to buy the requisite ingredients (because there are NO leftovers in my household haha) and throw them in my slowcooker for a satisfying meal that will last me for days on end. It keeps well too. I can't believe I'm reading a post about kiam chai boi! I LOVE LOVE LOVE this dish. My mother told me that sometimes her family would make it ... without leftovers! They'd make it from scratch because it's THAT GOOD. Thank you so much for the post! Brings back great memories! 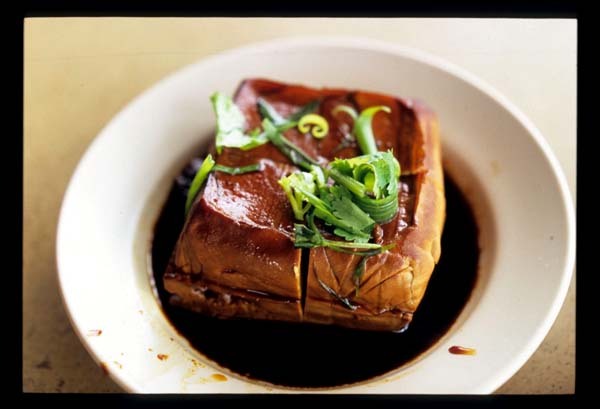 This is definitely a favorite Chinese dish. The Kiam chai is added with fresh kwah chai and stewed together with some assam slices, dried chili and chunky pieces of lechon. Incidentally, kiam chai is kwah chai after the vegetable is salted. When the dish is ready, the fat from the lechon would have gone into the dish, giving it a special aroma. 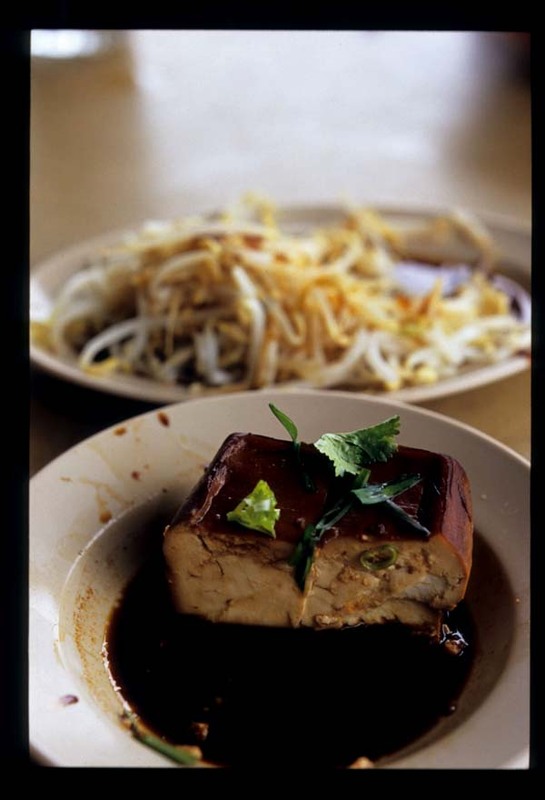 Yep, this is one popular dish among the Chinese! 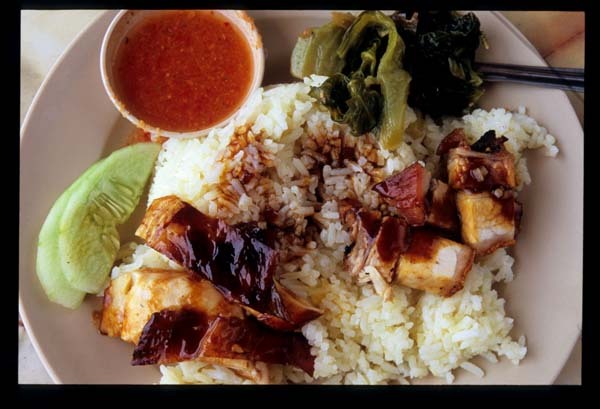 Any chicken rice shop that serves this dish will tell you how it helps in the sale of its rice. Nice! Annie's mum made this for us, using the duck heads and necks from a dinner at Loong Foong Seafood Restaurant in Paramount. She used dried chiles in the stew to heat things up. Hmm ... I'm not sure that what you have here is "kiam chai boi". I think you have what is called in Cantonese "kai choi" soup thing or other. 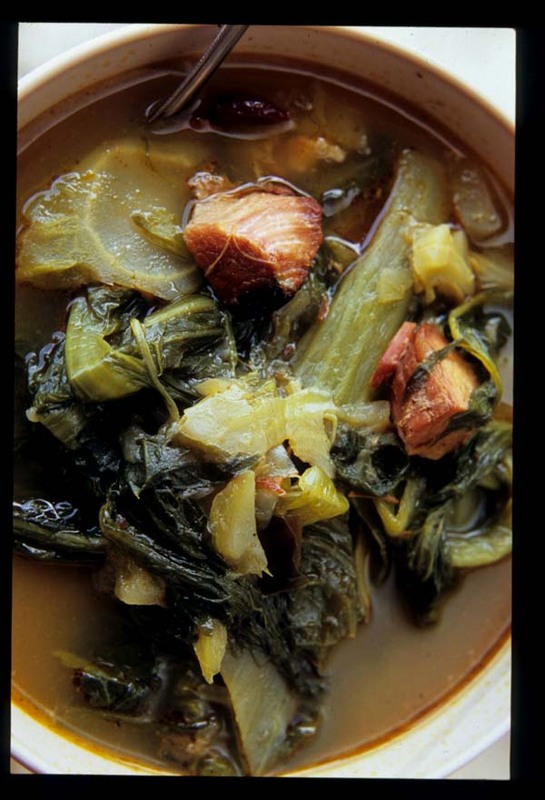 In Hokkien, we would usually call it "Kua chai khong assam" ("mustard greens simmered with tamarind". 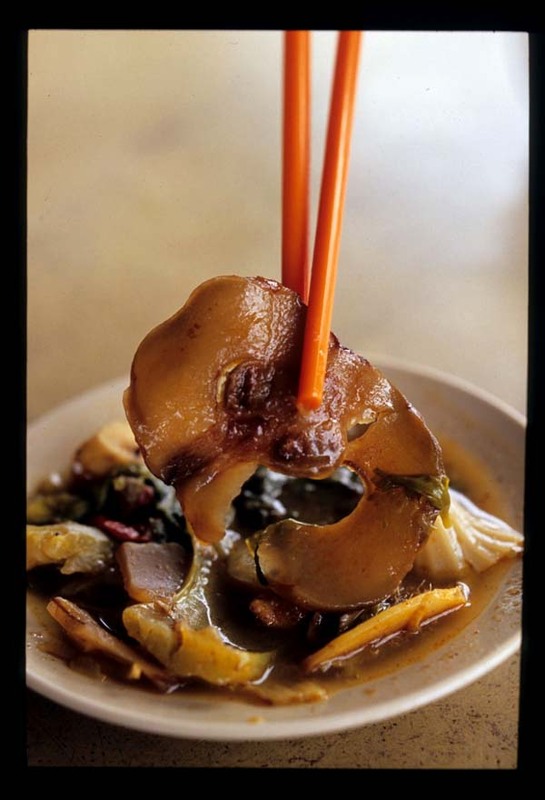 Kiam chai boi uses a different vegetable ("kiam chai" means salty vegetable, and it refers to the salty picked vegetable), so it uses the salty pickled vegetable as a base. While the recipe would differ from household to household, kiam chai boi according to my grandma's recipe would start with a base of kiam chai ark (salted veg and duck soup) and joo hoo char which would be left over from Chinese New Year's eve dinner. She would add more kiam chai, meatballs, pig's trotters. It's salty, not sour. Kiam chai boi is quite rare actually, and I'm not sure that there are many places which would serve it daily. 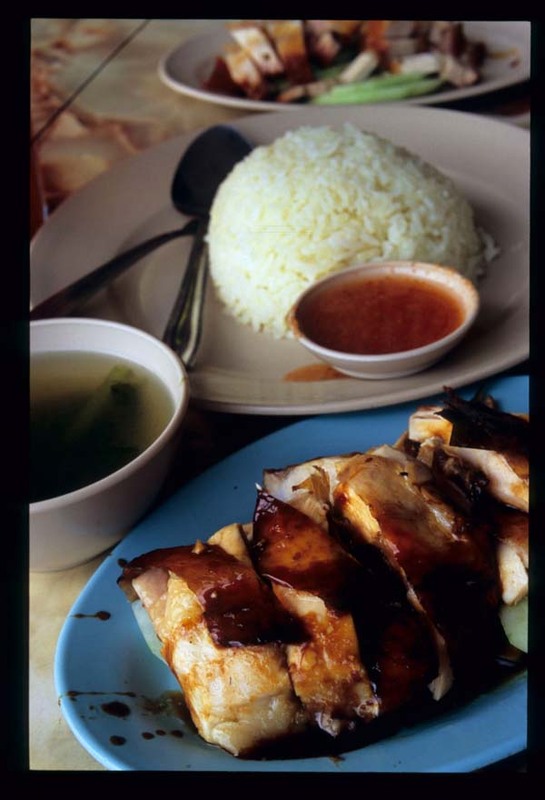 LL, Su-Lin, Bayi - this does seem to be a dish that strikes a chord in the hearts of Malaysian Chinese. From my perspective, it's got all the 'greats' of a good meal: spicy, sour, lots of veg, meat. I could eat it everyday, really. Burnt Lumpia - it is wonderful. I've tried to replicate it at home without success. One of those simple dishes that rises above its ingredients. Nate - that looks great! Cupcake - I don't know. When I googled kiam chai boi (and other spellings) it's this sour soup with assam keping that came up, consistently. Perhaps we have a case of crossed nomenclature wires here? RM - yes, I saw that turkey post. I think I headed out that afternoon for a dose of this vendor's sour veg soup! The dish is both slaty and sour. Salty from the kiam chai. Sour because of the assam slices. I like it slightly bitter too from the kwa chai. and of course, as a true Malaysian, I like it spicy with dried chilies. It's got all the exotic tastes to accommodate every taste bud! What a dish! What a DISH!